Editors' Note: There is a photo associated with this press release. The Singapore Land Transit Authority (LTA) today launched its first two new INNOVIA APM 100 automated people mover vehicles into passenger service on the Bukit Panjang Light Rapid Transit (LRT) system. LTA ordered 13 additional INNOVIA APM 100 vehicles from Bombardier in 2012 to substantially increase public transportation services in the Choa Chu Kang and Bukit Panjang districts. Bombardier will deliver eight vehicles in 2014 and the remaining five vehicles will follow in 2015. Peak-hour capacity will grow by approximately 50 per cent once all of the new vehicles are in service. Bombardier is also upgrading the LRT signalling and communications sub-systems to enhance overall system capacity and to integrate new platforms at the Choa Chu Kang LRT station into the system. Regular passengers on this popular urban transit system will enjoy improved services including more frequent trains and shorter waiting times. Benoit Cattin-Martel, Vice President Asia Pacific, Systems Division at Bombardier Transportation, said, "Since services began on the Bukit Panjang LRT system, the Singapore Land Transit Authority has consistently seen passenger numbers rise every year. The new fleet of INNOVIA APM 100 vehicles will enable the LTA to run more trains in two-car configurations thereby increasing capacity and improving services for commuters, proving that this transit technology is an ideal choice for urban operators." 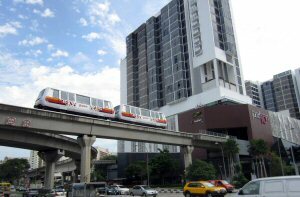 The original Bukit Panjang LRT system opened in 1999 with 19 INNOVIA APM 100 vehicles and the BOMBARDIER CITYFLO 550 fixed block train control solution for unattended driverless operation. It is an important urban feeder system connecting with rapid transit stations, bus interchanges, local recreational facilities, commercial complexes and schools. The system operates on an exclusive guideway, unhampered by cars and pedestrians. The rubber-tired trains are very quiet with windows that "mist" within six meters of residential buildings, thereby eliminating noise and privacy concerns.